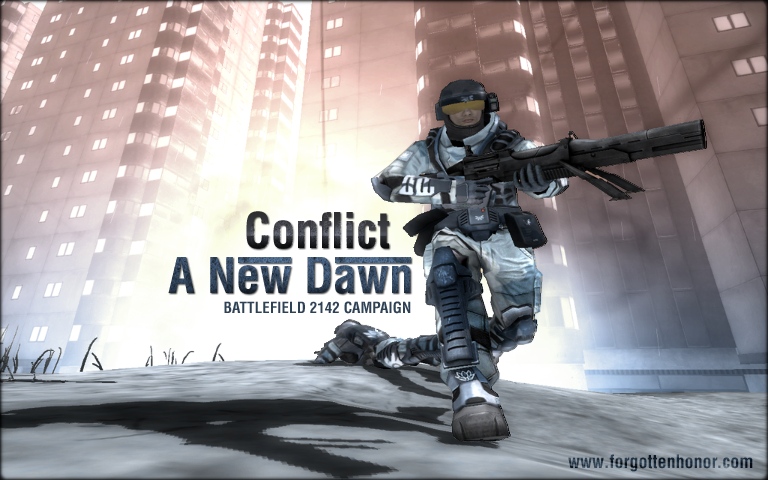 Conflict 2142 is a premier conversion for Battlefield 2142 providing multiple fixes to the game play as well providing new content to the game. The development has ended, and no future versions of CF2142 will be released. Signups for the coming Battlefield 2142 campaign open up this Friday, September 24th. The campaign will be played for 11 weeks and will pit two armies against each other fighting for survival in the future. Battles commence every Saturday at 6pm GMT (1pm EST) and last for eight hours. Each battle entails a brawl map consistently of infantry only and an occasional light vehicle, and prime maps which features all out warfare with the many additional jets and armor added with Conflict 2142, all on a massive Battlefield. With signups just around the corner, what are you waiting for Soldier? Pick up your gun and join the Conflict today! This is the final and last release of the Conflict 2142 Mod v303, so please enjoy our great mod update. Maps that are used on public servers running Conflict 2142 Modification. Adjusted for Public Server. why the hell is this mod dead\the map servers have all been taken down? can someone reupload all the maps so we can play more singleplayer than just highway tampa and strike at karkand? The map downloader (https://www.moddb.com/mods/conflict-2142/downloads/conflict-2142-custom-map-downloader) should function again. I've uploaded all the maps I could find on my drives. i only have highway tampa:( is there some kind of add on or map pack? I noticed that the PAC tank doesn't even shoot any projectiles. It only shows the muzzle flash and nothings comes out. i only have highway tampa as a SP map. that sux!! Pac and EU go head to head in an all out jungle warfare map. First map to fully feature "Attack or Defend". One of the many flooded cities became the perfect staging point for the PAC to set their ambush again the EU forces. This famous strech of US high way has become the staging ground of one largest battles fought in the conflict of 2142. Our favourite BF2 map has been ported over with all original buildings/textures and gamemode inc Coop and Single player and "Attack or Defend"
The War between the Pac and the EU force rages on, the armies now fighting over control over the Middle East. In 2143, the Pan Asian Coalition launched a secret attack into the Union Of African States territory of Nigeria, a large industrial center. The area contains an unfinished Harbor, which the PAC hope to use to supply further missions in Africa. "Wake Island" - A clasic bf2/1942 map ported over for you pleasure.